Looking for discounts? Get free GetMeCab coupons and deals to save up to 75%. Click to activate the code and start saving now!!! Get Rs.100 off on all outstation cab bookings. Minimum booking is not required. Use the voucher code at checkout to redeem the offer. Amazing Deal - Book a cab and get Rs.300 instant discount on one way outstation booking. No minimum booking is required. Apply coupon code during checkout page to avail this discount. 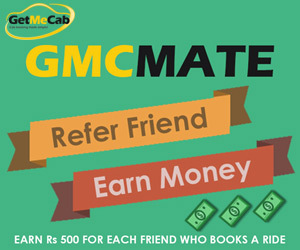 Grab flat Rs.150 off on all outstation rides at GetMeCab. Use coupon code to avail this offer. Book now. Hurry up!! Get AC Cabs at your doorstep starting at Rs. 9/Km plus ₹251 discount on each outstation cab ride. Use voucher code and avail 5% instant discount on your outstation booking from GetMeCab. Hurry! Valid for a limited period only. Grab flat Rs.150 off on all outstation trips in India from GetMeCab. Use Voucher Code to avail this offer. Plus extra Rs.80 cashback by using the voucher code. Book now! Get flat Rs.150 discount on all outstation trips booking in India. Use voucher code to avail this offer. Get Rs.200 off on all outstation ride across India. This offer is exclusively created for DGM users only. Valid in Delhi, Delhi NCR, Bangalore, Gurgaon, Ghaziabad, Chennai, Hyderabad, Jaipur and more cities. Book your cab now! Flat Rs.200 off on cab ride. This is valid for Chennai to Bangalore route and vice versa. This code can be used 3 times per user. Book Your Favorite Taxi Now. Hurry!! Avail 5% instant discount on your outstation booking at getmecab.com. Hurry, offer is valid for a limited period only.